Received March 6, 2018; Revised May 9, 2018; Accepted May 10, 2018.; Published online June 12, 2018. The capacity of differentiation of human pluripotent stem cells (hPSCs), which include both embryonic stem cells and induced pluripotent stem cells, into cardiomyocytes (CMs) in vitro provides an unlimited resource for human CMs for a wide range of applications such as cell based cardiac repair, cardiac drug toxicology screening, and human cardiac disease modeling. However, their applicability is significantly limited by immature phenotypes. It has been well known that currently available CMs derived from hPSCs (hPSC-CMs) represent immature embryonic or fetal stage CMs and are functionally and structurally different from mature human CMs. To overcome this critical issue, several new approaches aiming to generate more mature hPSC-CMs have been developed. This review describes recent approaches to generate more mature hPSC-CMs including their scientific principles, advantages, and limitations. Ischemic heart disease (IHD), characterized by a reduced blood supply to the heart, remains one of the leading causes of death worldwide (Mozaffarian et al., 2016). Particularly, myocardial infarction (MI), a major form of IHD, damages a majority of the myocardium leading to a condition in which almost half of affected patients die within a short time after the onset of symptoms mostly due to a reduction of cardiac contractile function below a critical threshold (Laflamme and Murry, 2011). Since the human heart has a limited regenerative capacity, cardiomyocytes (CMs) lost during MI is replaced by non-contractile scar tissue leading to the development of a thin ventricular wall that no longer contracts properly. Subsequently, it initiates a series of events that lead to remodeling, hypertrophy, and eventually heart failure (Pasumarthi and Field, 2002). Since current options for treating damaged hearts such as heart transplantation and artificial heart devices have noted limitations, in recent decades, CMs derived from pluripotent stem cells (hPSC) including embryonic stem cells (ESCs) and human induced pluripotent stem cells (hiPSCs) have received enormous attention as a promising source for cell based cardiac regeneration therapy (Shiba et al., 2012; Shigeru et al., 2016). CMs differentiated from hPSCs (hPSC-CMs) have many similarities with human primary CMs in terms of ion channels expression, sarcomere structure, calcium handling protein expression, contractile function, calcium transient, and excitation-contraction coupling (ECC) mechanism (Laflamme et al., 2007). However, their applicability is stymied by their resemblance to immature human CMs at embryonic or fetal stages and are functionally and structurally different from mature human CMs (Robertson et al., 2013). The hPSC-CMs lack organized myofibrils and have poor sarcomeric organization (Snir et al., 2003). Indeed, fetal-CMs are typically 30-fold smaller than adult-CMs, generate much weaker contractile force, and have different electrical properties (Davis et al., 2012). Hence, immaturity of hPSC-CMs significantly limits the potential for clinical applications. In response, many promising approaches aiming to generate mature hPSC-CMs have been sought and developed, which include long-term culture ( >100 days) (Lundy et al., 2013), and biomechanical stimulation (Tulloch et al., 2011). To mimic in vivo microenvironments, scientists also developed a more advanced 3 dimensional (3D) culture system, which co-culture non-CMs and extracellular matrix (ECM) components with an increase in substrate stiffness (Nunes et al., 2013). In this review article, we will review previously reported strategies for inducing hPSC-CMs maturation. Strengths and limitations of individual approaches will be thoroughly discussed. Differential characteristics between immature-CM and mature-CM are summarized in Table 1. CMs possess distinct morphological characteristics at different developmental stages. While fetal-CMs are mostly round-shaped, adult-CMs are more elongated and rod-shaped (Veerman et al., 2015). Also, adult-CMs are larger and longer than fetal-CMs. During the developmental period, fetal-CMs undergo a complex series of structural changes to obtain adult-like CM phenotypes. Indeed, hPSC-CMs are compared to fetal-CMs due to their similar morphological characteristics. Early hPSC-CMs (10–15 days after differentiation induction) are mostly round and small, analogous to fetal-CMs. After 50 days of culture, hPSC-CMs begin to illustrate structural changes and increase in size ang length, albeit still smaller than adult-CMs (Snir et al., 2003). While mature-CMs are aligned longitudinally to promote electrical conduction and synchronous contraction, hPSC-CMs are reported to be randomly distributed (Peters et al., 1993). In terms of nucleation, 25–30% of adult-CMs are binucleated regardless of age, whereas, fetal-CMs are single nucleated almost exclusively (Kim et al., 1992; Mollova et al., 2013). The morphology and function of mitochondria is also known as a critical marker for CM maturation (Feric and Radisic, 2016). Mature adult mitochondria are the power house of the cell facilitating efficient cellular respiration with extensive surface area provided by densely packed cristae (Feric and Radisic, 2016). However, cristae is absent in both fetal and hPSC-CMs (Scuderi and Butcher, 2017). Mitochondria of hPSC and fetal-CMs are also structurally different from those of adult-CMs. The size and shape of mitochondria in both fetal and hPSC-CMs are smaller and more round compared to mitochondria in adult-CMs. Mitochondria in hPSC-CM are slender and longer compared to the ovular-shaped adult-CM mitochondria which occupy over 35% of total cellular volume (Scuderi and Butcher, 2017). The alignment of mitochondria is essential for CM contraction due to the amount of energy required in a short period of time (Scuderi and Butcher, 2017). Mitochondria from adult-CMs are, therefore, well aligned in the direction of sarcomeres, and clustered close to the nucleus. However, mitochondria from fetal and hPSC-CMs are clustered to the periphery (Gherghiceanu et al., 2011). The major energy source of immature-CMs is also different from adult stage CMs. Immature-CMs rely on glycolysis, whereas, mature-CMs use fatty-acid oxidation due to the corresponding increase in oxidative capacity (Yang et al., 2014a). Transverse tubules are highly-specialized structures that enable electrical impulses to enter the cell and initiate excitation-contraction coupling (ECC). Therefore, the formation of T-tubules is the hallmark of CM maturation (Ziman et al., 2010). However, hPSC-CMs lack T-tubules when cultured in 2D cultures (Lieu et al., 2009). Lack of transverse tubule (T-tubules) in hPSC-CMs result in unsynchronized calcium transients, as demonstrated by uniform calcium dynamics with greater amplitudes at the edge than center of the cell (Lieu et al., 2009). hPSC-CMs are shown to have slow electrical propagation due to a lack of sodium channels, with a velocity of 10–20 cm/s compared with 60cm/s in human left ventricles (Lee et al., 2012). There are several factors that contribute to the conduction velocity, such as gap junction composition and distribution. For instance, the distribution of connexin 43 (Cx43), a protein involved in forming gap junctions in human ventricles, differs between hPSC-CMs and adult-CMs. While Cx43 disperse at the intercalated disc, located near the periphery of adult-CMs, they are span circumferentially in hPSC-CMs which is not optimal for longitudinal electrical signal transduction (Vreeker et al., 2014). Cardiac action potential is orchestrated by an amalgam of channels acting together in four distinct phases (Yang et al., 2014a). At phase 0, the rapid sodium influx (INa) depolarizes the cell. The following potassium transient outward current (Ito1) slightly repolarizes the cell at phase 1. Phase 2 is a plateau phase, maintained by L-type calcium channels (ICaL). During phase 3, the rapid and slow delayed rectifier K+ channels (IKr, IKe) open, and rapidly repolarize the cell. Resting membrane potential (RMP) −85mv is reached and maintained by rectifying K+ current (KCNJ2) during phase 4 (Amin et al., 2010). hPSC-CMs express minimal levels of KCNJ2 channels, resulting a less negative RMP −50mv ~ −60 mv, compared to the normal −85mv in adult-CM (Zhang et al., 2009). Fetal-CMs have a RMP around −40mv at day 21 and around −65 mv at days 28~49 as they mature respectively (Liu et al., 2016). hPSC-CMs and fetal-CMs have a pacemaker current, which is nearly undetectable in adult-CMs (Sartiani et al., 2007). The asynchronous and spontaneous contractions of hPSC-CMs are thought to be caused by the combined pacemaker currents and unstable RMPs (Veerman et al., 2015). The more depolarized RMP might also be a contributor of slow upstroke of action potential at phase 0, and reduced availability of sodium ion influx (Ma et al., 2011). The slow upstroke is thought to result from the lower level of sodium channels (Sartiani et al., 2007). Another sign of maturation indicated by previous studies is the increasing expression of Ito1 potassium channels, which coordinates the repolarization in phase 1 (Wang et al., 2003). Immature-CMs also have less lCaL that might account for the shorter plateau phase (Sartiani et al., 2007). Maturation is a gradual process which normally requires 6 to 10 years for human neonatal CMs to reach their adult phenotype in vivo (Peters et al., 1994). However, functional hPSC-CMs can be generated within 15 days of differentiation (Laflamme and Murry, 2011). To nurture more mature-CMs, researchers initially increased the culturing time of hPSC-CM in vitro. Among the first, Lundy et al., cultured hPSC-CMs up to 100 days and found some key morphological changes such as multinucleation, increase in sarcomere length, cell size, and elongated shape (Fig. 1) (Lundy et al., 2013). In addition, Kamarura et al. (2013) observed gradual changes of sarcomere organization of hPSC-CM during one year in culture. They overserved Z and I bands appearing after 30 days of culture. The A-bands also developed during the 30–90 days period of cultures and the M-bands were finally induced at longer culturing times of up to 360 days. As a critical parameter of CM maturation, electrophysiological properties were shown to be enhanced through prolonged culture. Sartiani et al., cultured hPSC-CMs for three months and demonstrated increased densities of the inward rectifier current (Ik1) and Ito1, although the densities for IKr and ICaL remained unchanged (Sartiani et al., 2007). While long-term culture is relatively easy and does not require expensive experimental equipment, it is labor intensive and inefficient. Furthermore, previous studies have not reached consensus on the duration required to culture mature-CM phenotypes. The inherent possibility of batch-to-batch variations of long term culture also confines this methodology to small scale experiments precluding large scale clinical applications. Most importantly, there has been no study demonstrating adult phenotype of hPSC-CMs following prolonged culture even after 200 days (Veerman et al., 2015). The myocardium is a 3D structure composed of CMs, extra cellular matrix (ECM), and endothelial cells in the blood vessels that constantly interact with each other (Yang et al., 2014a). By using this concept, 3D culture has been shown to have many benefits on CM maturation (Fig. 1). Indeed, 3D cultures are often combined with other strategies to enhance the viability and functional maturation of CMs by means of mechanical or electrical stimulation (Mihic et al., 2014). The hydrogel technique has been the most extensively used method in cardiac tissue engineering due to its capability to promote cell adhesion and growth (Pedron et al., 2011). Studies have suggested that certain properties in the hydrogel highly mimic the microenvironment of cardiac tissues to provide mechanical support for CM maturation (DeForest and Anseth, 2012). There are three essential elements for hydrogel-based approaches: natural gelling products, casting molds, and anchoring constructs. Primarily, the most common gelling products is either a mixture or independent compositions of collagen, matrigel, fibrin, alginate. The gelling process encapsulate cells into the 3D space, while molds and anchors help CMs develop a 3D structure with stable support (Hirt et al., 2014). Hydrogels can be physically and chemically modified to enhance CM properties with ease, therefore, many next generation hydrogels with oxygen-releasing, elastomeric and conductive features have been developed (Camci-Unal et al., 2014). Many 2 dimensional (2D) cultures failed to produce mature-CM phenotypes due to a lack of extracellular substrates. The ECM in the heart is a complex, dynamic structure, and entirely different from static tissue culture on the plastic well. There are two approaches of CM maturation through differential ECMs including i) the addition of matrix proteins in scaffolds and ii) the modulation of substrate stiffness (Veerman et al., 2015). For example, VanWinkle developed a cardiogel containing cardiac fibroblasts, laminin, fibronectin, types I and III collagen, and proteoglycans and seeded immature-CMs on the cardiogel (Vanwinkle et al., 1996). Subsequently, authors observed that those immature-CMs cultured on the cardiogel displayed mature phenotypes including spontaneous contractility, hypertrophy and myofibrillar and cytoskeleton differentiation earlier than 2D culture cells. Authors concluded that these changes resulted from the synergistic actions of various components in the ECM. In addition, although still far from adult phenotypes, Zhang et al. (2012), also cultured immature hPSC-CMs on a matrix sandwich that overlaid matrigel composed of laminin, collagen IV, and proteoglycan and detected more robust differentiation and enhanced electrophysiological properties. These results suggest the importance of selection of optimal substrates to promote the maturation of CMs. Decellularized cardiac ECMs (dcECMs) from all animal sources has also been proposed to promote maturity of immature hPSC-CMs since dcECMs contain complete cardiac ECM structures and vasculature systems essential for cardiac development. However, this technique is not fully developed and has many drawbacks, especially in the decellularization process, during which some ECM components are disrupted (Scuderi and Butcher, 2017). While the balance between the strength and limitation is still debated and require future research, the benefits of ECM to CM maturation are indisputable. ECMs provide hPSC-CM with essential developmental cues that influence proliferation, differentiation and maturation. Myocardium stiffening processes including collagen accumulation occurs during the developmental process, beginning from the embryonic stage to the adult stage. The 3-fold increase of elastic modulus of stiffness in mice strongly affects the heart’s ability to pump blood and increases blood pressure (Prakash et al., 1999; Yang et al., 2014a). Based on these observations, several previous studies have provided evidences on the effect of substrate stiffness on cardiac maturation. Jacot et al., seeded rat neonatal CMs on collagen with various degrees of elastic moduli (1–50 kPa) for 7 days and found that the optimal extracellular stiffness that induces morphological and functional maturation was at 10 kPa, which closely resembles native myocardium rigidity (Jacot et al., 2008). They showed that 10 kPa induced maximal force generation, largest calcium transient, substantial sarcoplasmic calcium stores and the highest SERCA2a expression. Hazeltine et al., also tested polyacrylamide hydrogels with varying degrees of stiffness from 4.4 kPa to 99.7 kPa and observed that higher stiffness ( > 10 kPa) induces a stronger contraction force in both rat neonatal and hPSC-CMs (Hazeltine et al., 2012). CMs only occupy 30% of the entire heart and are constantly in close contact with other cells such as fibroblasts, endothelial cells and smooth muscle cells in vivo. Thus it is plausible that these non-CMs such as cardiac fibroblasts and vascular endothelial cells can exert an impact on CM maturation through direct physical contact or paracrine effects (Fig. 1) (Yang et al., 2014a). A cardiac microenvironment mimicking physiological conditions in vivo is crucial for inducing CM differentiation as well as maturation. The report from Kim et al., was among the first study to demonstrate that non-CMs enhance the electrophysiological maturation for hESC-CMs (Kim et al., 2010). Authors found faster upstroke velocity, more hyperpolarized maximum diastolic potential and higher action potential amplitude when immature-CMs were co-cultured with non-CMs. Co-cultures with non-CMs are de novo methods in the field mimicking in vivo conditions in the heart to accommodate cell-cell interactions. Co-culture of immature-CMs with fibroblasts and/or endothelial cells show significant benefits in maturation. Recent studies combining non-CMs with highly enriched ECMs in a cardiac patch platform seems promising for CM maturation in vitro and in vivo post engraftment. Shadrin et al. (2017) combined the hydrogel-molding method with a dynamic culture system consisting of hPSC-CMs, smooth muscle cells and endothelial cells to generate cardiac patches of clinically relevant size. While transplanted CMs failed to couple with recipient hearts, in vivo engraftment of dynamic cultured mature hPSC-CMs via cardiac patches showed successful perfusion, structural and electrophysiological preservation without increasing the incidence of arrhythmias (Shadrin et al., 2017). Similarly, human cardiac muscle patches (hCMPs) composed of dynamic culture of CMs, smooth muscle cells and endothelial cells differentiated from hiPSCs on fibrin scaffolds were transplanted on to porcine MI models. The in vitro results demonstrated improvements in electronic mechanical coupling, calcium handling, force generation, and presence of intercalated disk-like structures as maturation indicators. In vivo transplantation of hCMP also significantly improved left ventricular function, decreased infarct size, reduced myocardial hypertrophy, and decreased apoptosis of heart cells adjacent to the scar zone (Gao et al., 2018). In summary, 3D tissue engineering can mimic the native environment in the heart providing hPSC-CMs with essential biochemical cues. However, it is not scalable due to the limitation for producing 3D engineered heart tissues. Furthermore, 3D tissue engineering causes significant cell loss during the production of 3D engineered heart tissues (EHTs) and is limited by many obstacles. CMs in vivo are constantly exposed to electrical impulses which invoke morphological and functional changes (Fig. 1) resulting in changes in CM gene expression during the developmental process (Martherus et al., 2010). As evidence, Martherus et al. (2010) performed a genome-wide assessment of rat CMs following electrical stimulation and found that cardiac-specific genes such as Myosin Heavy Chain 6 (MYH6), Gap junction alpha-1 protein (GJA1, also known as Cx43), and CACNA1C (L-type calcium channel) were upregulated suggesting electrical signals have major impacts on gene expression and perhaps also on CM differentiation independently from contraction. In regard to hPSC-CMs, Nunes et al. (2013) developed a biowire system which contains EHTs made by a mixture of embryiod bodies (EB) differentiated from hPSCs and collagen in a poly-dimethylsiloxane (PDMS) template. After applying electrical stimulation, authors found increased surface area and organized sarcomere structure with H zones, I bands, and Z-discs in hPSC-CMs (Nunes et al., 2013). Electrophysiological properties including conduction velocity, KCNJ2 expression and synchronous beating were also improved. However, electrical stimulation is not as intensively studied as other strategies and is usually combined with other methods (Nunes et al., 2013). Therefore, several confounding factors such as ECM interaction, different scaffold composition (different conductivity) may result in the heterogeneity in the impact of electrical stimulation (You et al., 2011). The thickness, geometry of micro-environment, and composition of biomaterials also play a role in the heterogeneity (Sankova et al., 2012). Electrical stimulation is not suitable for large scale studies, and excessive electrical impulse can cause cell death. The heart is essentially a mechanical pump that continuously responds to mechanical stimuli at all developmental stages. Therefore, mechanical stress can be a critical factor in shaping CM maturation (Fig. 1) (Takahashi et al., 2013). There are three major types of mechanical stimuli during heart development: i) strain due to heart filling, ii) hemodynamic loads from blood flow and iii) force generated during contraction (Taber, 2001). These native mechanical stimuli gave insights to design programs which mimic physiological processes to induce CM maturation in vitro, including cyclic stretch, pulsatile flow, and 3D tissue engineering or electrical stimulation combined with mechanical stimulation. Cyclic stretch has been the most common approach in many studies, and they demonstrate increased rate of maturation in hPSC-CMs (Mihic et al., 2014; Shimko and Claycomb, 2008). Cyclic stretch at rates of 1–2 Hz was shown to promote maturation both morphologically and functionally in hPSC-CMs. Mechano-electric feedback (MEF), the interplay between mechanical stimuli and electrical conduction, determines the macroscopic events throughout the heart (Kohl and Ravens, 2003). The mechanisms of MEF involve several pivotal mechanosensitive ion channels which influence CM electrophysiology and maturation (Scuderi and Butcher, 2017; Takahashi et al., 2013). As an example, Mihic et al. (2014) applied cyclic stretch to hPSC-CMs and showed an increase in ion channel genes such as KCNJ2. Cyclic stretch also increased the expression of IK1 and negative RMPs. Subsequently, several recent studies incorporate mechanical stretch with tissue engineering, a combination which leads to greater maturation success. For instance, mechanical stretch applied to hPSC-CMs on a 3D matrix (hydrogels of collagen 1 and basement membrane proteins) enhanced CM maturation at a faster rate (Zimmermann et al., 2002). It is worth mentioning that they even exhibited proper T-tubules connected to the sarcoplasmic reticulum. They also displayed more negative RMP, faster upstroke velocity and marked plateau phases during calcium influx. In addition, cyclic stretch applied to hESC-CMs on gelatin-based scaffolds resulted in enhanced connexin expressions, higher spontaneous beating frequencies, and faster calcium cycling. Mechanical stimulation mimics natural cues for heart cells and can achieve CM maturation in a relatively shorter period compared to prolonged culture. The combination of 3D tissue engineering with cyclic stretch is superior to other 2D mechanical stimulations due to the enhanced nutrient exchange and cytoskeleton interactions. However, it is not scalable and inappropriate mechanical strain can cause extensive cell death. Postnatal hormones are considered one of the most promising source for inducing CM maturation (Fig. 1) (Scuderi et al., 2017). Specifically, thyroid hormones were shown to be effective for regulating several proteins such as myosin heavy chain and Titin, which are essential to cardiac development (Krüger et al., 2008). A study demonstrated triiodothyronine (T3) helps with morphological maturation in sheep fetus (Chattergoon et al., 2012). After fusion with T3, CMs had increased cell size, cell width and higher binucleation percentages. Furthermore, T3 increased expression of SERCA2a but reduced the expression of certain proteins involved in cell proliferation (Chattergoon et al., 2012). T3 also induced similar beneficial effects on hPSC-CMs in another study done by Yang et al. (2014b). They demonstrated that a one–week treatment of T3 significantly improved anisotropy, cell size, sarcomere length and contractile force. The improvement on force generation is associated with rapid calcium cycling and elevated expression of SERCA2a. They even showed a significant increase in the maximal mitochondria respiratory capacity and respiratory reserve capacity (Yang et al., 2014b). Glucocorticoids are also considered important hormones that exert impact on heart function via the glucocorticoid receptors (GR) (Oakley and Cidlowski, 2015). A study from Rog-Zielinska et al. (2015) suggests that corticosterone critically promotes Z-disc assembly, mitochondria activity and myofibrillar organization. A recent study done by Parikh et al. (2017), also suggests that addition of both T3 and dexamethasone (Dex), a glucocorticoid analog, to hPSC-CMs significantly enhance ECC by promoting spatial and temporally uniform calcium release and RYR2 structural organization. Notably, treatment with both T3 and Dex promote T-tubule formation. Although T-tubule density didn’t have a significant difference, the T3 + Dex treated hPSC-CMs contained more longitudinal elements that resemble transversely oriented T-tubules in human ventricular CMs (Parikh et al., 2017). In addition, T-tubules formed in the T3 + Dex treated group were electrically connected to the sarcolemma on hPSC-CMs. hPSC-CMs have shown great promises in many potential applications such as cell based cardiac regeneration therapy, cardiac drug toxicity testing, cardiac disease modeling. However, despite many advantages, the potential use of hPSC-CMs have been significantly hampered by the multi-faceted nature of immature hPSC-CMs. Therefore, concerted efforts have been made in recent years to develop more sophisticated and efficient strategies to induce the maturation of hPSC-CMs. Current approaches to induce mature phenotypes of hPSC-CMs include both mechanical and electrical stimulation, 3D cardiac tissue remodeling, modification of substrate stiffness, combinatorial co-culture to promote paracrine effects, and biochemical cues using several postnatal hormones as well as miRNAs. Recent trends that combine several existing strategies have achieved incremental improvements for generating more matured hPSC-CMs. For instance, the combination of mechanical and electrical stimulation shows a collective effect of a 2-fold increase in contractile function (Ruan et al., 2016). Furthermore, 3D engineering of heart tissues with non-CMs and ECM greatly enhance morphological and functional maturation. Recent studies exploring 3D cardiac patches by modifying matrix substrates, and co-culture with other cell types, not only have functional and morphological improvements of hPSC-CMs in vitro, but also achieve clinical relevance when engrafted to animal MI models in vivo (Gao et al., 2017; Shadrin et al., 2017). 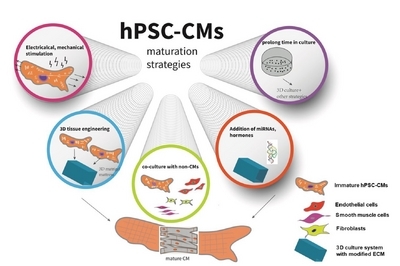 Thus, it is noteworthy to mention that 3D tissue engineering, and a combinational approach exploring multiple maturation strategies seems to be promising to generate more mature hPSC-CMs. Addition of “hormones cocktail” and “miRNA cocktail” into 3D culturing system seems to be the next logical approach to induce hPSC-CMs maturation. In summary, technological advances in the maturation of hPSC-CMs have opened a new chapter for realistic application of hPSC-CMs. Although initial success was achieved for maturation of CMs from differentiating hPSC cultures, several limitations such as scalability, clinical compatibility, and cellular damage remain to be answered. Extensive future studies will be required to develop optimal methods to efficiently generate large-scale mature hPSC-CMs. Fig. 1. Currently available strategies for maturing cardiomyocytes derived from human pluripotent stem cells. Amin, A.S., Tan, H.L., and Wilde, A.A. (2010). Cardiac ion channels in health and disease. Heart Rhythm . 7, 117-126. Camci-Unal, G., Annabi, N., Dokmeci, M.R., Liao, R., and Khademhosseini, A. (2014). Hydrogels for cardiac tissue engineering. NPG Asia Mater . 6, e99. Chattergoon, N.N., Giraud, G.D., Louey, S., Stork, P., Fowden, A.L., and Thornburg, K.L. (2012). Thyroid hormone drives fetal cardiomyocyte maturation. FASEB J . 26, 397-408. Davis, R.P., Casini, S., van den Berg, C.W., Hoekstra, M., Remme, C.A., Dambrot, C., Salvatori, D., Oostwaard, D.W., Wilde, A.A., and Bezzina, C.R. (2012). Cardiomyocytes derived from pluripotent stem cells recapitulate electrophysiological characteristics of an overlap syndrome of cardiac sodium channel disease. Circulation . 125, 3079-3091. DeForest, C.A., and Anseth, K.S. (2012). Advances in bioactive hydrogels to probe and direct cell fate. Annu Rev Chem Biomol Eng . 3, 421-444. Feric, N.T., and Radisic, M. (2016). Maturing human pluripotent stem cell-derived cardiomyocytes in human engineered cardiac tissues. Adv Drug Deliv Rev . 96, 110-134. Gao, L., Gregorich, Z.R., Zhu, W., Mattapally, S., Oduk, Y., Lou, X., Kannappan, R., Borovjagin, A.V., Walcott, G.P., and Pollard, A.E. (2018). Large cardiac muscle patches engineered from human induced-pluripotent stem cell-derived cardiac cells improve recovery from myocardial infarction in swine. Circulation . 137, 1712-1730. Gherghiceanu, M., Barad, L., Novak, A., Reiter, I., Itskovitz-Eldor, J., Binah, O., and Popescu, L.M. (2011). Cardiomyocytes derived from human embryonic and induced pluripotent stem cells: comparative ultrastructure. J Cell Mol Med . 15, 2539-2551. Hazeltine, L.B., Simmons, C.S., Salick, M.R., Lian, X., Badur, M.G., Han, W., Delgado, S.M., Wakatsuki, T., Crone, W.C., and Pruitt, B.L. (2012). Effects of substrate mechanics on contractility of cardiomyocytes generated from human pluripotent stem cells. Int J Cell Biol . 2012, 508294. Hirt, M.N., Hansen, A., and Eschenhagen, T. (2014). Cardiac Tissue Engineering. Circ Res . 114, 354. Jacot, J.G., McCulloch, A.D., and Omens, J.H. (2008). Substrate stiffness affects the functional maturation of neonatal rat ventricular myocytes. Biophys J . 95, 3479-3487. Kamakura, T., Makiyama, T., Sasaki, K., Yoshida, Y., Wuriyanghai, Y., Chen, J., Hattori, T., Ohno, S., Kita, T., and Horie, M. (2013). Ultrastructural maturation of human-induced pluripotent stem cell-derived cardiomyocytes in a long-term culture. Circ J . 77, 1307-1314. Kim, H.D., Kim, D.J., Lee, I.J., Rah, B.J., Sawa, Y., and Schaper, J. (1992). Human fetal heart development after mid-term: morphometry and ultrastructural study. J Mol Cell Cardiol . 24, 949-965. Kim, C., Majdi, M., Xia, P., Wei, K.A., Talantova, M., Spiering, S., Nelson, B., Mercola, M., and Chen, H.S. (2010). Non-cardiomyocytes influence the electrophysiological maturation of human embryonic stem cell-derived cardiomyocytes during differentiation. Stem Cells Dev . 19, 783-795. Kohl, P., and Ravens, U. (2003). Cardiac mechano-electric feedback: past, present, and prospect. Prog Biophys Mol Biol . 82, 3-9. Krüger, M., Sachse, C., Zimmermann, W.H., Eschenhagen, T., Klede, S., and Linke, W.A. (2008). Thyroid hormone regulates developmental titin isoform transitions via the phosphatidylinositol-3-kinase/ AKT pathway. Circ Res . 102, 439. Laflamme, M.A., and Murry, C.E. (2011). Heart regeneration. Nature . 473, 326-335. Laflamme, M.A., Chen, K.Y., Naumova, A.V., Muskheli, V., Fugate, J.A., Dupras, S.K., Reinecke, H., Xu, C., Hassanipour, M., and Police, S. (2007). Cardiomyocytes derived from human embryonic stem cells in pro-survival factors enhance function of infarcted rat hearts. Nat Biotechnol . 25, 1015-1024. Lee, P., Klos, M., Bollensdorff, C., Hou, L., Ewart, P., Kamp, T.J., Zhang, J., Bizy, A., Guerrero-Serna, G., and Kohl, P. (2012). Simultaneous voltage and calcium mapping of genetically purified human induced pluripotent stem cell-derived cardiac myocyte monolayers. Circ Res . 110, 1556-1563. Lieu, D.K., Liu, J., Siu, C.W., McNerney, G.P., Tse, H.F., Abu-Khalil, A., Huser, T., and Li, R.A. (2009). Absence of transverse tubules contributes to non-uniform Ca2+ wavefronts in mouse and human embryonic stem cell-derived cardiomyocytes. Stem Cells Dev. 18, 1493-1500. Liu, J., Laksman, Z., and Backx, P.H. (2016). The electrophysiological development of cardiomyocytes. Adv Drug Deliv Rev . 96, 253-273. Lundy, S.D., Zhu, W.Z., Regnier, M., and Laflamme, M.A. (2013). Structural and functional maturation of cardiomyocytes derived from human pluripotent stem cells. Stem Cells Dev . 22, 1991-2002. Ma, J., Guo, L., Fiene, S.J., Anson, B.D., Thomson, J.A., Kamp, T.J., Kolaja, K.L., Swanson, B.J., and January, C.T. (2011). High purity human-induced pluripotent stem cell-derived cardiomyocytes: electrophysiological properties of action potentials and ionic currents. Am J Physiol Heart Circ Physiol . 301, H2006-2017. Martherus, R.S., Vanherle, S.J., Timmer, E.D., Zeijlemaker, V.A., Broers, J.L., Smeets, H.J., Geraedts, J.P., and Ayoubi, T.A. (2010). Electrical signals affect the cardiomyocyte transcriptome independently of contraction. Physiol Genomics . 42A, 283-289. Mihic, A., Li, J., Miyagi, Y., Gagliardi, M., Li, S.H., Zu, J., Weisel, R.D., Keller, G., and Li, R.K. (2014). The effect of cyclic stretch on maturation and 3D tissue formation of human embryonic stem cell-derived cardiomyocytes. Biomaterials . 35, 2798-2808. Mollova, M., Bersell, K., Walsh, S., Savla, J., Das, L.T., Park, S.Y., Silberstein, L.E., Dos Remedios, C.G., Graham, D., and Colan, S. (2013). Cardiomyocyte proliferation contributes to heart growth in young humans. Proc Natl Acad Sci USA . 110, 1446-1451. Mozaffarian, D., Benjamin, E.J., Go, A.S., Arnett, D.K., Blaha, M.J., Cushman, M., Das, S.R., de Ferranti, S., Després, J.P., and Fullerton, H.J. (2016). Heart disease and stroke statistics—2016 update. A Report From the American Heart Association . 133, e38-e360. Nunes, S.S., Miklas, J.W., Liu, J., Aschar-Sobbi, R., Xiao, Y., Zhang, B., Jiang, J., Massé, S., Gagliardi, M., and Hsieh, A. (2013). Biowire: a platform for maturation of human pluripotent stem cell-derived cardiomyocytes. Nat Methods . 10, 781-787. Oakley, R.H., and Cidlowski, J.A. (2015). Glucocorticoid signaling in the heart: A cardiomyocyte perspective. J Steroid Biochem Mol Biol . 153, 27-34. Parikh, S.S., Blackwell, D.J., Gomez-Hurtado, N., Frisk, M., Wang, L., Kim, K., Dahl, C.P., Fiane, A., T⊘nnessen, T., and Kryshtal, D.O. (2017). Thyroid and glucocorticoid hormones promote functional T-tubule development in human-induced pluripotent stem cell–derived cardiomyocytes. Circ Res . 121, 1323-1330. Pasumarthi, K.B., and Field, L.J. (2002). Cardiomyocyte cell cycle regulation. Circ Res . 90, 1044-1054. Pedron, S., van Lierop, S., Horstman, P., Penterman, R., Broer, D.J., and Peeters, E. (2011). Stimuli responsive delivery vehicles for cardiac microtissue transplantation. Adv Funct Mater . 21, 1624-1630. Peters, N.S., Green, C.R., Poole-Wilson, P.A., and Severs, N.J. (1993). Reduced content of connexin43 gap junctions in ventricular myocardium from hypertrophied and ischemic human hearts. Circulation. 88, 864-875. Peters, N.S., Severs, N.J., Rothery, S.M., Lincoln, C., Yacoub, M.H., and Green, C.R. (1994). Spatiotemporal relation between gap junctions and fascia adherens junctions during postnatal development of human ventricular myocardium. Circulation. 90, 713. Prakash, Y.S., Cody, M.J., Housmans, P.R., Hannon, J.D., and Sieck, G.C. (1999). Comparison of cross-bridge cycling kinetics in neonatal vs. adult rat ventricular muscle. J Muscle Res Cell Motil. 20, 717-723. Robertson, C., Tran, D.D., and George, S.C. (2013). Concise review: maturation phases of human pluripotent stem cell-derived cardiomyocytes. Stem Cells. 31, 829-837. Rog-Zielinska, E.A., Craig, M.A., Manning, J.R., Richardson, R.V., Gowans, G.J., Dunbar, D.R., Gharbi, K., Kenyon, C.J., Holmes, M.C., and Hardie, D.G. (2015). Glucocorticoids promote structural and functional maturation of foetal cardiomyocytes: a role for PGC-1α. Cell Death Differ. 22, 1106-1116. Ruan, J.L., Tulloch, N.L., Razumova, M.V., Saiget, M., Muskheli, V., Pabon, L., Reinecke, H., Regnier, M., and Murry, C.E. (2016). Mechanical stress conditioning and electrical stimulation promote contractility and force maturation of induced pluripotent stem cell-derived human cardiac tissue. Circulation. 134, 1557-1567. Sankova, B., Benes, J., Krejci, E., Dupays, L., Theveniau-Ruissy, M., Miquerol, L., and Sedmera, D. (2012). The effect of connexin40 deficiency on ventricular conduction system function during development. Cardiovasc Res. 95, 469-479. Sartiani, L., Bettiol, E., Stillitano, F., Mugelli, A., Cerbai, E., and Jaconi, M.E. (2007). Developmental changes in cardiomyocytes differentiated from human embryonic stem cells: a molecular and electrophysiological approach. Stem Cells. 25, 1136-1144. Scuderi, G.J., and Butcher, J. (2017). Naturally engineered maturation of cardiomyocytes. Front Cell Dev Biol. 5, 50. Shadrin, I.Y., Allen, B.W., Qian, Y., Jackman, C.P., Carlson, A.L., Juhas, M.E., and Bursac, N. (2017). Cardiopatch platform enables maturation and scale-up of human pluripotent stem cell-derived engineered heart tissues. Nat Commun. 8, 1825. Shiba, Y., Fernandes, S., Zhu, W.Z., Filice, D., Muskheli, V., Kim, J., Palpant, N.J., Gantz, J., Moyes, K.W., and Reinecke, H. (2012). Human ES-cell-derived cardiomyocytes electrically couple and suppress arrhythmias in injured hearts. Nature. 489, 322-325. Shigeru, M., Fukushima, S., Imanishi, Y., Kawamura, T., Mochizuki-Oda, N., Masuda, S., and Sawa, Y. (2016). Building a new treatment for heart failure-transplantation of induced pluripotent stem cell-derived cells into the heart. Curr Gene Ther. 16, 5-13. Shimko, V.F., and Claycomb, W.C. (2008). Effect of mechanical loading on three-dimensional cultures of embryonic stem cell-derived cardiomyocytes. Tissue Eng Part A. 14, 49-58. Snir, M., Kehat, I., Gepstein, A., Coleman, R., Itskovitz-Eldor, J., Livne, E., and Gepstein, L. (2003). Assessment of the ultrastructural and proliferative properties of human embryonic stem cell-derived cardiomyocytes. Am J Physiol Heart Circ Physiol. 285, H2355-H2363. Taber, L.A. (2001). Biomechanics of cardiovascular development. Annu Rev Biomed Eng. 3, 1-25. Takahashi, K., Kakimoto, Y., Toda, K., and Naruse, K. (2013). Mechanobiology in cardiac physiology and diseases. J Cell Mol Med. 17, 225-232. Tulloch, N.L., Muskheli, V., Razumova, M.V., Korte, F.S., Regnier, M., Hauch, K.D., Pabon, L., Reinecke, H., and Murry, C.E. (2011). Growth of engineered human myocardium with mechanical loading and vascular coculture. Circ Res. 109, 47-59. Vanwinkle, W.B., Snuggs, M.B., and Buja, L.M. (1996). Cardiogel: A biosynthetic extracellular matrix for cardiomyocyte culture. In Vitro Cell Dev Biol Anim. 32, 478-485. Veerman, C.C., Kosmidis, G., Mummery, C.L., Casini, S., Verkerk, A.O., and Bellin, M. (2015). Immaturity of human stem-cell-derived cardiomyocytes in culture: fatal flaw or soluble problem?. Stem Cells Dev. 24, 1035-1052. Vreeker, A., van Stuijvenberg, L., Hund, T.J., Mohler, P.J., Nikkels, P.G., and van Veen, T.A. (2014). Assembly of the cardiac intercalated disk during pre- and postnatal development of the human heart. PLoS One. 9, e94722. Wang, Y., Xu, H., Kumar, R., Tipparaju, S.M., Wagner, M.B., and Joyner, R.W. (2003). Differences in transient outward current properties between neonatal and adult human atrial myocytes. J Mol Cell Cardiol. 35, 1083-1092. Yang, X., Pabon, L., and Murry, C.E. (2014a). Engineering adolescence: maturation of human pluripotent stem cell-derived cardiomyocytes. Circ Res. 114, 511-523. Yang, X., Rodriguez, M., Pabon, L., Fischer, K.A., Reinecke, H., Regnier, M., Sniadecki, N.J., Ruohola-Baker, H., and Murry, C.E. (2014b). Tri-iodo-l-thyronine promotes the maturation of human cardiomyocytes-derived from induced pluripotent stem cells. J Mol Cell Cardiol. 72, 296-304. You, J.O., Rafat, M., Ye, G.J.C., and Auguste, D.T. (2011). Nanoengineering the heart: Conductive scaffolds enhance connexin 43 expression. Nano Lett. 11, 3643-3648. Zhang, J., Klos, M., Wilson, G.F., Herman, A.M., Lian, X., Raval, K.K., Barron, M.R., Hou, L., Soerens, A.G., and Yu, J. (2012). Extracellular matrix promotes highly efficient cardiac differentiation of human pluripotent stem cells: the matrix sandwich method. Circ Res. 111, 1125-1136. Zhang, J., Wilson, G.F., Soerens, A.G., Koonce, C.H., Yu, J., Palecek, S.P., Thomson, J.A., and Kamp, T.J. (2009). Functional cardiomyocytes derived from human induced pluripotent stem cells. Circ Res. 104, e30-41. Ziman, A.P., Gómez-Viquez, N.L., Bloch, R.J., and Lederer, W.J. (2010). Excitation-contraction coupling changes during postnatal cardiac development. J Mol Cell Cardiol. 48, 379-386. Zimmermann, W.H., Schneiderbanger, K., Schubert, P., Didié, M., Münzel, F., Heubach, J.F., Kostin, S., Neuhuber, W.L., and Eschenhagen, T. (2002). Tissue engineering of a differentiated cardiac muscle construct. Circ Res. 90, 223-230.